With a firm commitment to quality, our organization is engaged in manufacturing and exporting a wide range of Wrought Iron Staircase Railing. Usage/Application: Home, Office, Hotels etc. We are a coveted manufacturer of optimum quality gamut of SS Wrought Iron Parapet Railing. 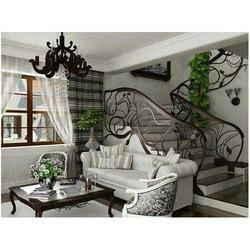 Matching up with the requirements of our clients, we are involved in offering Wrought Iron Balcony Railing. Being a leader in the industry, we are engaged in manufacturing a qualitative range of Wrought Iron Railing. In order meet the requirements of our customers, we are providing an inclusive range of Wrought Iron Compound Wall Railing. In addition, we offer this product at nominal costs to our customers. 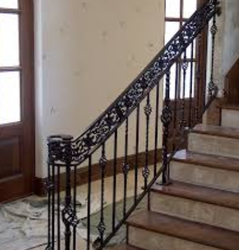 We take great pride in announcing that we are one of the leading suppliers of Wrought Iron Interior Railings, which are fabricated by utilizing the finest grades of wrought iron. These interior railings are developed in such a manner that these can be easily incorporated into glass designs.